Exploring a city by car is a fun and thrilling way to experience all the sights and sounds of a new place or even one that you’ve previously been to! Whether you’re a first time road-tripper or an experienced driver of the great outdoors, Oneshift is here to share with you all you need to know before you start planning a road trip for your next vacation! First, driving yourself during a holiday enables you to travel at your own pace. Whether you’re one that wants to cover all that it is in just 24 hours, or take it slow and steady, waking up in the late afternoons, you can do so in your ride. Driving in scenic places allows you to immerse in the unrivalled beauty and even allows you to stop and get out of your car to further take in the sights. Hate the squeezing with the hoards of tourists? Driving allows you to plan your schedule and you can head to the must-visit attractions during the off-peak periods and explore sights off-the-beaten-track. For families with young children, driving also offers you ease of moving from one city to the next as you can bring along the luggage you have without worry about bringing up the stairs or shovelling through public transport. Whichever destination you are intending to take a road trip, you should spend some time to understand the various driving rules and regulations. For instance, you’ll need to know whether you are driving on the right hand side or left hand side of the road. In South Korea and in Iceland, drivers sit on the left hand side of the car. As such, turns may be slightly counter-intuitive for Singaporean drivers. 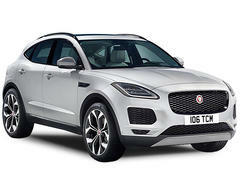 Take into account also, the driving conditions such as whether there are any off-road driving routes. If your car is unable to go off-road, you’ll need to plan an alternative route. Remember, off-road driving and 4WDs are for the experienced drivers as beginners may find it difficult to control these cars on the dirt tracks. 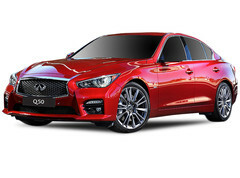 Alongside knowing these driving regulations, many countries, such as South Korea and Japan, require an international driving permit before you can even rent a car. To apply for one, you can either walk in to the AAS office or apply it online. For those in a rush, head to the AA office at GB Point (Kallang Bahru) or Ang Mo Kio and you’ll get it on the spot within an hour. The International Driving Permit fee costs $20 and is valid for a year. 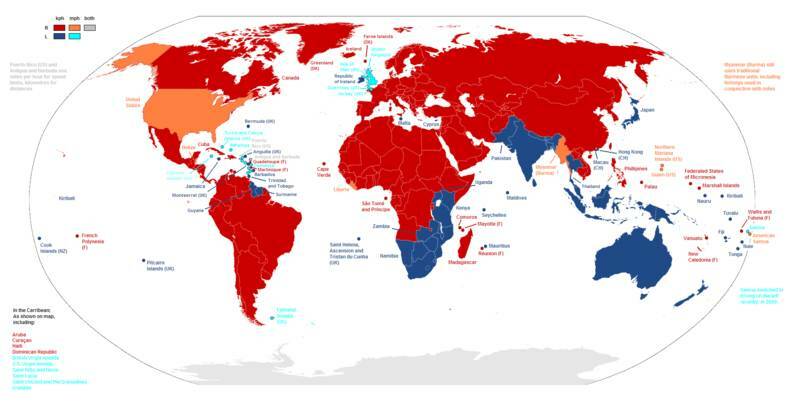 There are countries where their weather is unpredictable. It might be sunny at the start of your drive and thunderous on your way to your next pitstop... Are you ready for such varying weather? Also, driving in summer isn’t quite the same as driving in winter. 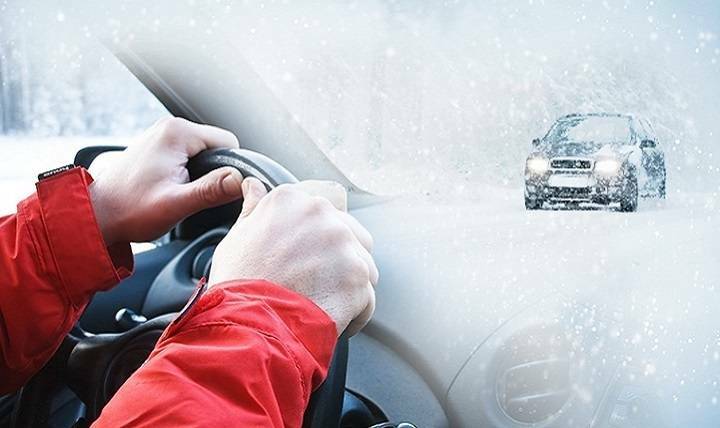 Winter driving requires more skill and experience. 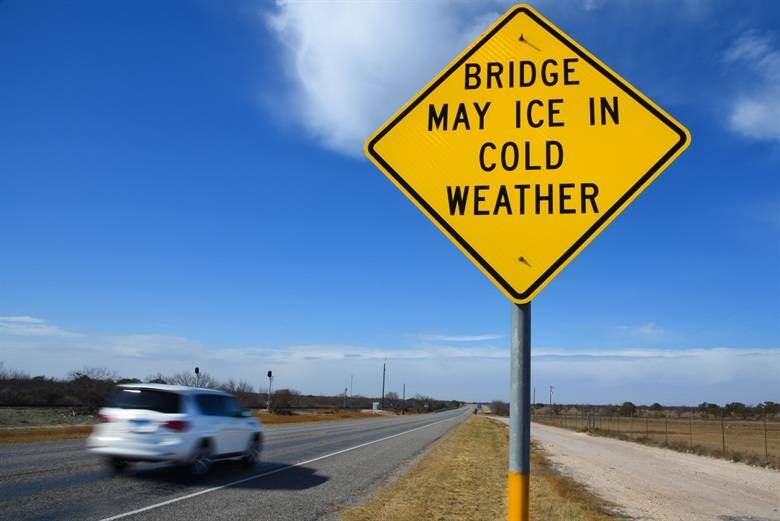 You will also need to ensure that your car has studded tyres, equipped for icy roads. A family road trip is almost like a rite of passage for drivers. It can be a great bonding experience, but if families are feeling cramped and uncomfortable on the long drives, the experience can be etched in your minds in the wrong way… Because you’re gonna be in it most of the way, getting your car right, or getting the right car is important. 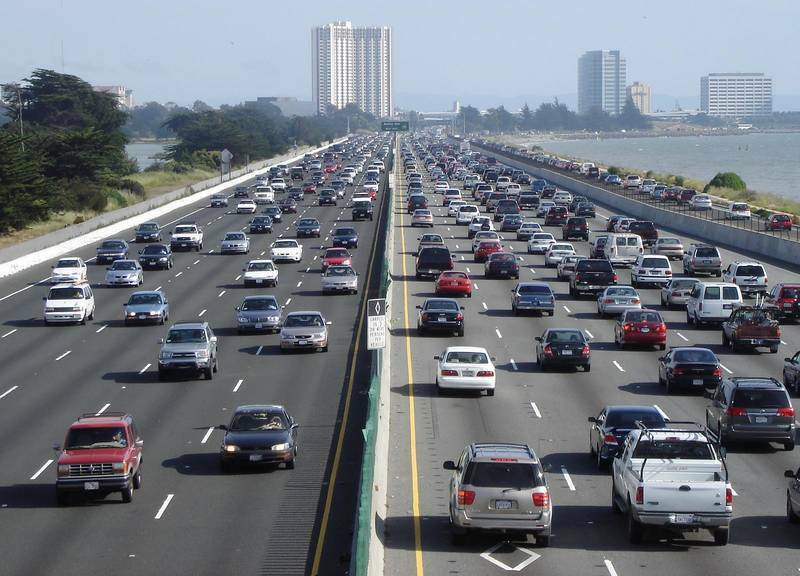 Some cars are predisposed to overheating and premature component failure; and the chances of them occurring increase tremendously when moving in slow moving or start-stop traffic. What’s worse than having to survive traffic jams is having to survive a car that is about to break down. Eeks. This may cause certain inconveniences when made to wait in line – especially one that is almost fully loaded with family and gear. For those taking the drive to neighbouring countries like Malaysia, or even heading all the way to Thailand, you should ensure that you bring your car to your workshop to get it checked. This would help to reduce any instances where your car fails during the roadtrip itself! A few important things include checking that your tyres are in good condition (no overly worn tyres) plus it is of the right pressure and topping up your fluids and coolants. Something that many may leave out would be the condition of your spare tyre, plus tools to change out that tyre! Servicing should be done at least a week before your trip to allow for time to change out whatever that needs to be changed out! 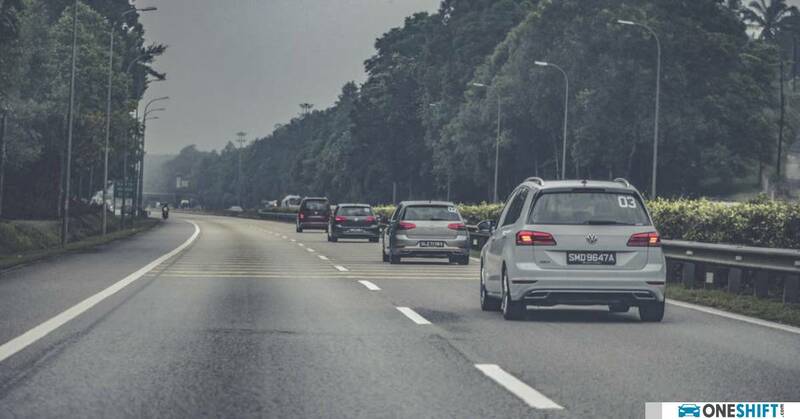 Should you be travelling into Malaysia during the peak school holiday season, the lack of moving air to cool the radiator and engine would cause warm air to find its way into the cabin and lead to much unwanted discomfort. 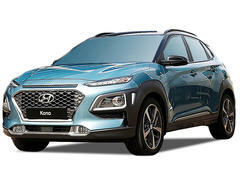 Most cars are also designed to prevent the engine from overheating and may cut off the aircon compressor automatically to reduce the load on the engine. Sometimes a faulty temperature sensor may incorrectly cause the same even when it is cooler. Aircon servicing is certainly important in this case! You really don’t want to be driving unnecessary pails, buckets, and whatever that has been sitting in your boot for the long drive! Removing items that you do not need also gives you more room for an additional luggage for your shopping. But there are some must-have tools for the roadtrip such as a set of jumper cables and jack. Hmmm, what about a new ride? Since no one buys a vehicle simply because you are planning for a road trip, those are just a few things that you can do to your current ride to make the ride more comfortable. 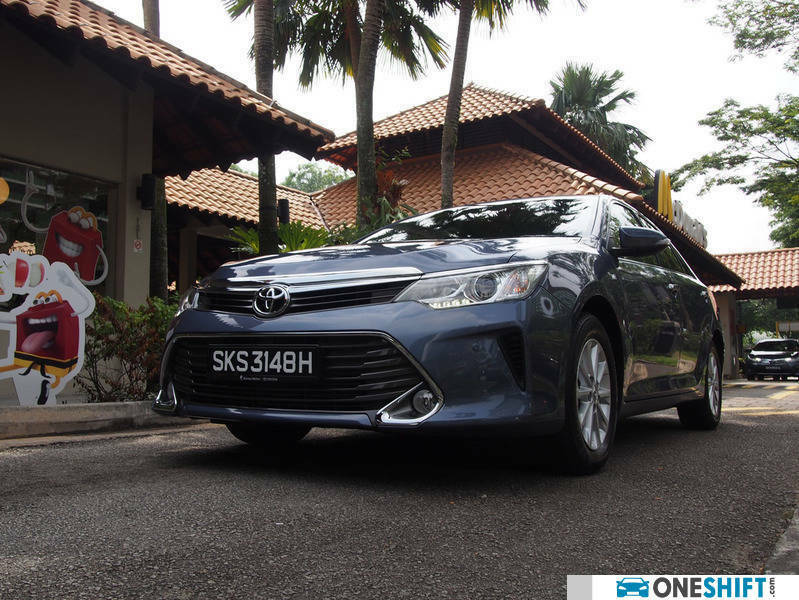 But if you are at this point, considering a new vehicle and are looking to go for more roadtrips (even if it is from the West to East Coast Park every weekend), road-trip-worthiness cars should factor into your buying decision. After all, you are going to be spending a lot of time together in this vehicle! Sure, it may seem vanilla, but the Toyota Camry is a D-segment Gem that boosts great passenger comfort and a large boot – everything you need for that perfect road trip. What’s great to know is that your reliable Toyota is a fuel-sipper with a no-fuss driving experience. Otherwise, the Kia Sorento is a sporty SUV that has ample space for the entire family (5+2). 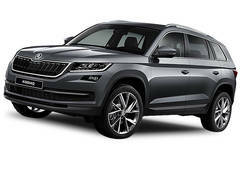 Though the third row’s occupants may feel a little squeezy, it may be just all that you need for the occasional road trips with the grandparents, with the kids seated at the rear. Even if you’re a family of five, the teenagers could use that extra space. The large panoramic sliding sunroof even allows your passenger to engage in some stargazing at night! 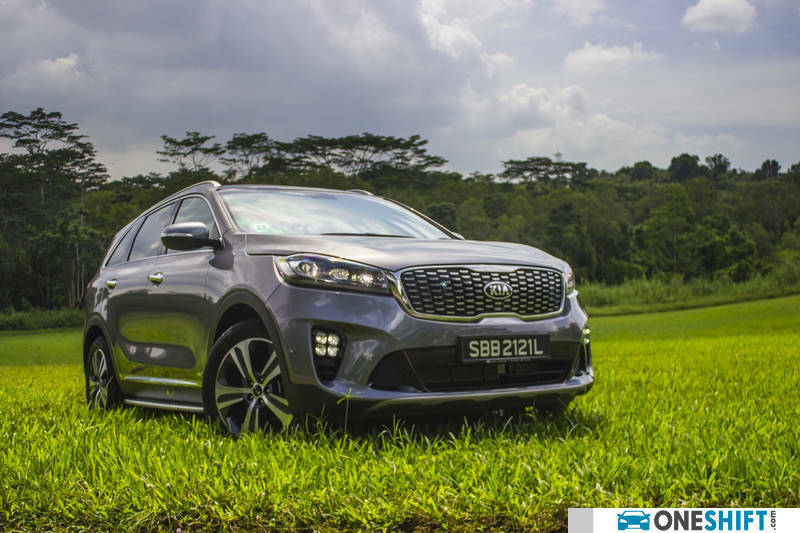 At 15.4km/l the AWD Sorento may not be the most efficient for a diesel, but still it is diesel! 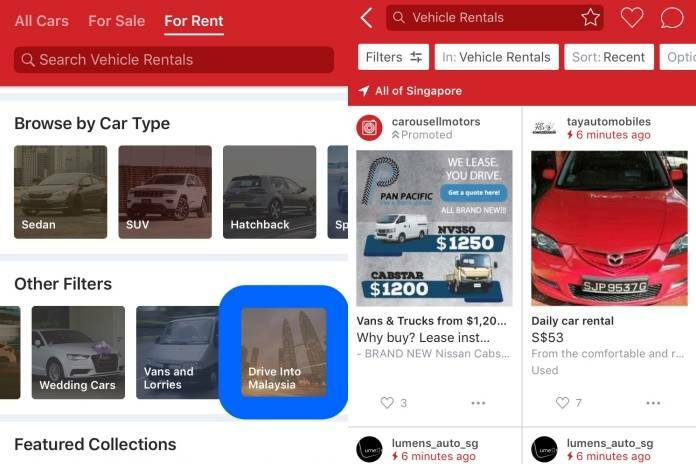 For those heading to Malaysia for a road trip but do not own a vehicle, Carousell has a plethora of listings for rental cars that you can rent and drive to Malaysia. Fire up the Carousell app, and head to the “Car Rental” category and use the “Drive into Malaysia” filter. For desktop users, we’ve done so for you so that it is much easier, just click this link here. If you are heading somewhere further and won’t be bringing your beloved ride with you, the possibilities are endless! One thing to note is that the cheapest car or cheapest car rental company may not necessarily be the best. It is good to research on your car rental company and read reviews before you put down that deposit to book the cars. If unsure, international chains like Sixt or Hertz would be a safer bet (though they may be more expensive than the local ones). Another thing to consider would be the location of the car rental company. Will you be doing a round trip (starting and ending point the same location)? Or would you like to drive to a destination and drop off your car? Smaller car rental companies may not have options for the latter. 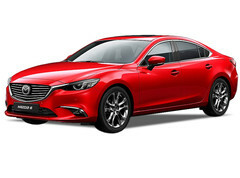 After selecting the car rental company, it is time to choose that car! 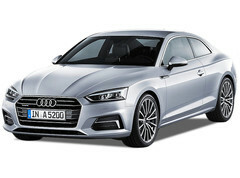 Depending on whether your rental companies offer these cars, you may want to splurge a little for that roadtrip with some drool-worthy cars like the Range Rover Velar or the BMW X3. Our Car of the Year 2017 (stay tuned for 2018! 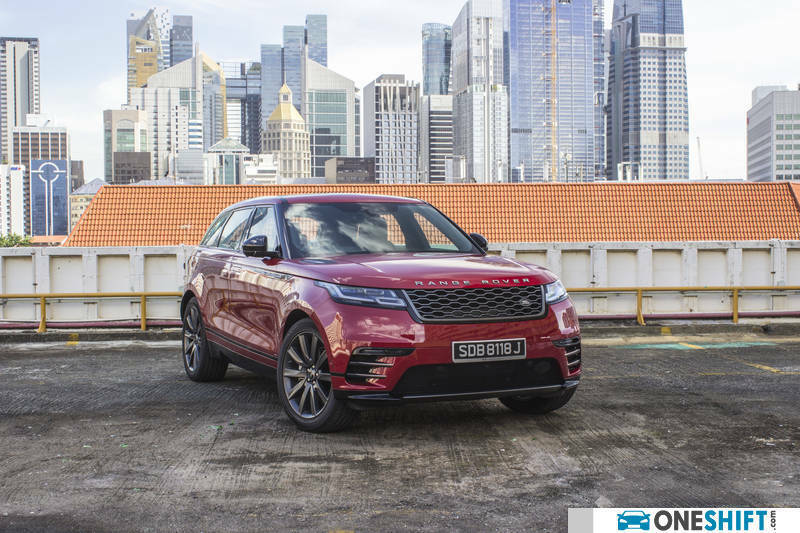 ), the Range Rover Velar has generous legroom for its occupants, allowing them to relax while on the road. Boot space is at a significant 673 litres so you really do not have to worry about overpacking (except for your airline restrictions!). 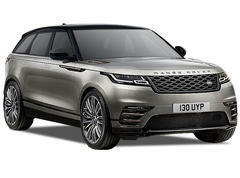 The Velar provides good road manners with its adjustable air suspension. 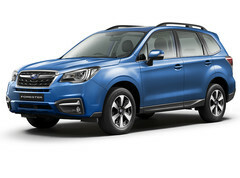 Coupled with its large wheels and Terrain Response, the suspension delivers great wheel articulation when required. The BMW X3 has an automated boot with 550 litres of cargo room that gives you sufficient space for all your luggage. 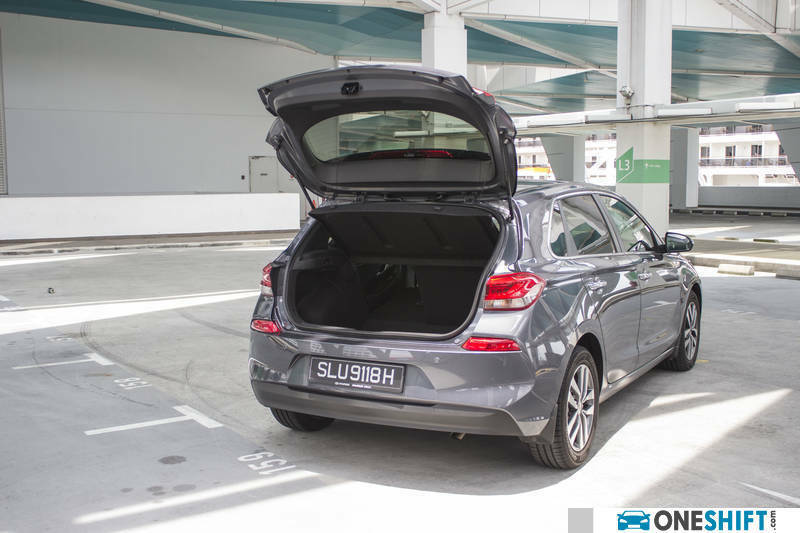 What’s great about its boot is that you can stow your important things away from prying eyes in the underfloor compartment. 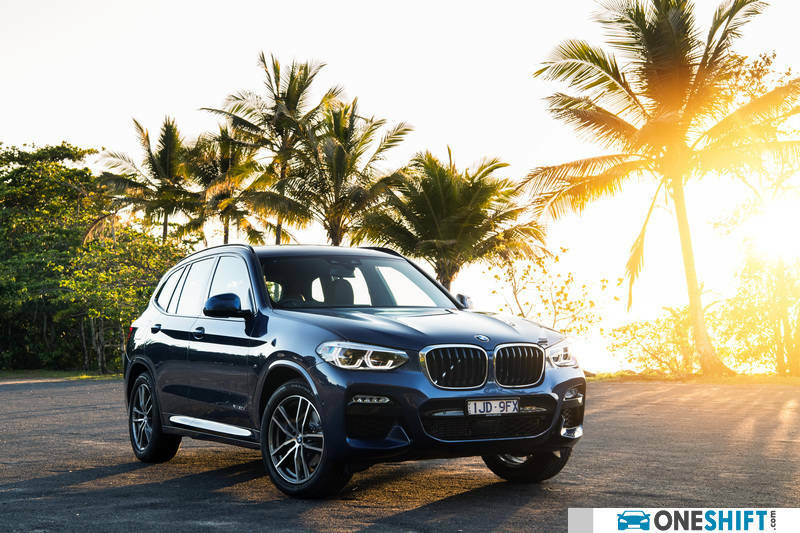 The X3 xDrive system alongside all its safety features like traction control and ABS does its job during not-so-ideal weather, keeping the car predictable especially on moist gravel surfaces. When going overseas, it is a must to purchase travel insurance. If you are intending to do any extreme sports such as sky diving, bungee jumping, scuba diving, snow and ice sports, or even doing slightly more dangerous activities such as a hot air balloon ride, you may just want to take an insurance of higher coverage. 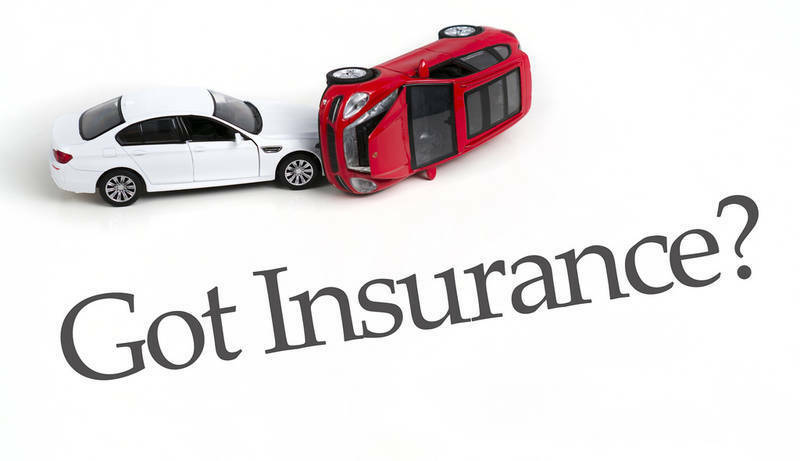 Besides travel insurance, those renting a car will also need to purchase car insurance. 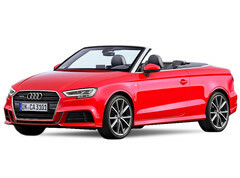 Most car rental companies offer these on top of the cost of renting the car and it is best to err on the side of caution. There are some people who are convinced that they are excellent and experienced drivers who think that they do not need to get much insurance. However, they fail to take into account that there are so many drivers on the roads who are not exactly good drivers, drunk drivers, or even just drivers who do not pay attention to the traffic and the roads! How will you ever assure that these would not affect you? Therefore, it is advisable to fork out just a bit more for complete coverage. Plan in advance if you intend to have a co-driver. Co-drivers are great for long drives as you can take turns to drive. The main driver can rest when feeling too tired to ensure a safe trip for everyone throughout the journey. Some car rental companies charge a little more for insurance for a second driver so you will have to let them know if you do want to do so. Don’t try to save on such because if anything happens and if the main driver isn’t the one on the wheel (crosses finger), you’ll have to bear the costs of the accident. Another must-have for destinations that you’re going to visit for the first time. Some car rental companies do provide them for free, while others charge a nominal fee. Though in today’s digital age, you can actuallly survive with your google maps with a strong 3G signal, some countries may not have constant 3G in certain areas and you really don’t want to be stranded. Always always bring the necessary medicine you’ll need and perhaps a first aid kit. Common medication to have on you are those for diarrhea, stomaches, headaches, and flu. Alongside medicine, water is the next most important or if not more essential item that you’ll need to have inside your car. Get those 1.5 litres and store it away. When you’re on the road, you may feel peckish yet some places may not have any cafes or restaurants until an hour away. Here’s where your hidden stash is important! Keep a great playlist of your favourite songs. Sometimes when on the highway, there’s not much of a scenery and driving can become dull. Play some of those lively jams to keep you awake and ensure that you have fun on the road. You could sing along to some of them too! Perhaps this is then the most important as most of us can’t live without our phones! Also, those youtube videos are a great way to keep the kids entertained. Consider getting ChangiWifi which is a portable wifi device that allows up to 5 devices to be connected simultaneously, great for families. Now, there’s an additional 2 days free rental for the device if you use the code “FOC2EOY” here. Plan for the routes you are going to take, including the alternatives. Also, you may wish to keep your drives to about 6 to 8 hours per day, more if you really can take it or have a co-driver. Also, keep loose plans to allow yourselves to venture off the planned routes for some adventure! Now that you’re all prepared for that big drive, go for it and enjoy the entire process! 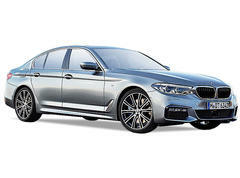 Why do the Chinese Love Long Wheelbase Cars?